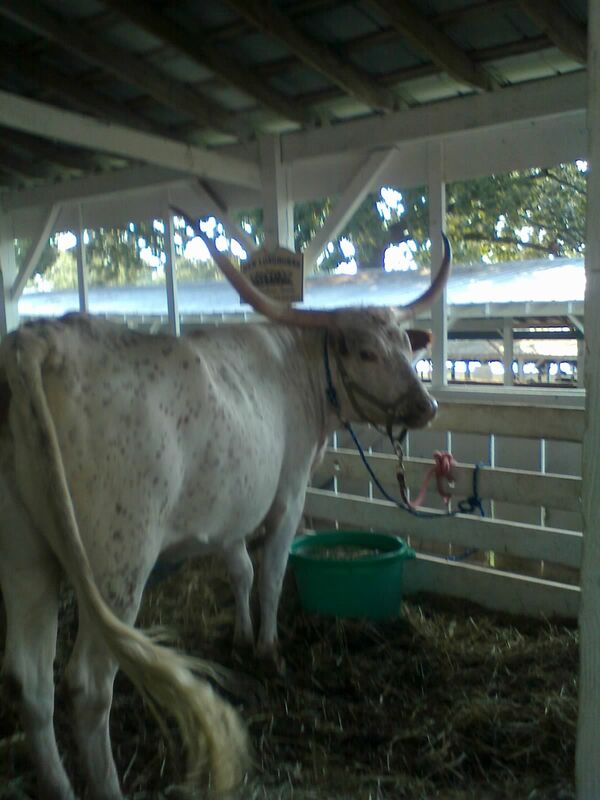 Yesterday I had the fortune to get to the Montgomery County Fair. We are staying in North Potomac with Ellie and Steve Kahan, who are my parents’ best friends from college, but have been my other set of parents for my while life. It’s a wonderful relationship because they’re parental toward us, but the element of guilt is removed since we’re not technically their children. 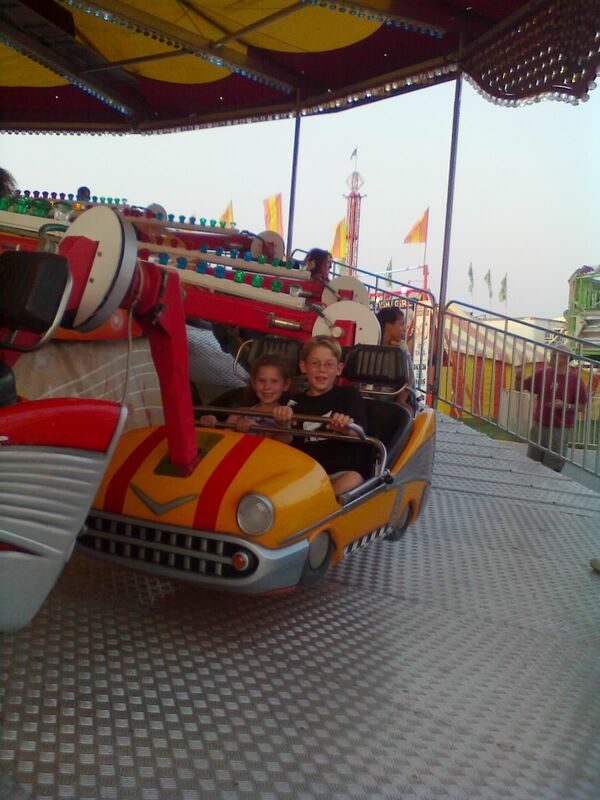 We all get to enjoy the other benefits of family, though, and I think going to the fair together highlighted the fun togetherness that family defines. The fairgounds are a huge, grassy lot in Gaithersburg. There is a huge parking lot beside it and of course, there is a fee to park. The whole thing is a major moneymaker for the city and the county. People enter the fair through one, designated entrance, which of course, leads them right onto the boardwalk-like area of games and rides with the accompanying onslaught of sights and sounds that could overwhelm even the most steel-stomached fair-goer. Luckily, simply by turning left, we were able to get to the simpler pleasures of the day. Bailey and Sydney pat the bunny! wares. Prizes are given for large and hearty pigs, cows, steer and goats. There is a rabbit barn and a bee-keeper. 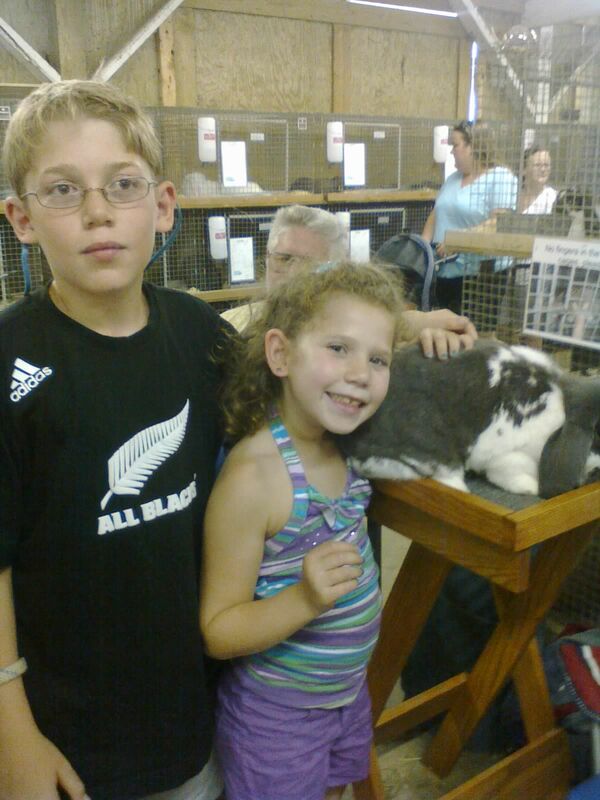 Ellie and Steve were very pleased that they were able to take my city kids to the farm! We went through the goat house, saw big, huge sheep, petted rabbits, admired the steer, saw the prize-winning cow and then Sydney had a pony-ride. It was a terrific experience for all of us. Of course, my darling daughter held her dainty, little nose as we went through the various animal areas lest she get a whiff of something unsavory! We laughed at her until she stopped. Then it was time for the rides and games. Both kids earned a small prize by throwing basketballs into a hoop, and that was enough of that. (Frankly, we can’t fit bigger prizes into our luggage back to Tokyo!) I allowed the kids two rides apiece. My daredevil son chose this huge thing that was simply a circle on its side and went upside down. Of course I had to do it with him! Forward upside down is one thing – backward is quite another! Then the kids went on a race-car ride and I took Sydney on the tilt-a-whirl. After we were all properly dizzy, we left! On the race-car ride - it went backward and forward too! It really was quite an experience. The sights, the crowds, the various walks of life that populate the fair – it all comes together to form a whole, which if you ask most Americans, makes up the image they have in their heads of a county fair. It’s like an American archetype – THE FAIR. Certain images just appear in one’s head when someone mentions it. Thusfar, the Weinstein kids haven’t had those images and I was so glad to give them to them. I feel like our American visit is complete. It’s my favorite fair. I have many fantastic memories of that place, having lived there for 7 years. Thanks for the memories…. and I hope you ate kettle corn and saw the butter sculpture!